One of the most successful styles to have survived to this day is Itto Ryu. In Japanese, it means literally: “one sword”. The exact date of the formulation of the style is difficult, but it can be traced to sometime in the middle of the 16th century. The founder of this style was a man named Yagoro. At age fourteen, Yagoro arrived in the little seaside village named Ito. How he got there is speculation. According to legend, he floated across the narrow Sea of Sagami from the island of Oshima on a piece of wood. Villages were closed societies in that time and hostile to strangers. However the young Yagoro soon earned the friendship of the inhabitants, when he drove away six bandits who attacked the village one day. He ended up remaining there for some years. The villagers then saved up money for him to travel to seek out a master, since he had expressed the wish to become a great swordsman. He went to Kamakura to the famous Hachiman Shrine to pray to the gods. He stayed there for six nights, practicing and praying, on the seventh night, he was attacked from behind by some unknown assailant. Somehow he sensed the attack, drew his sword, turned and cut the man down in one stroke. His technique was spontaneous and done without any thought. He did not understand the meaning of the technique he had used that night until many years later, when it would become the fundamental technique and philosophy of the style he would eventually create. He would also change his name to Ito Ittosai Kagehisa. Ono Tadaaki who became the successor to the Itto style when Ito Kagehisa mysteriously disappeared from the field of Koganegahara where Tadaaki and a would be successor, Zenki, fought a duel to decide who would succeed Ittosai as the next master ofthe style. He was reputed to be an excellent swordsman, even superior to Yagyu Munenori, but his cold and stern character earned him less respect and admiration than his contemporary Munenori. Along with Munenori, he was also designated as an official teacher of swordsmanship to the Tokugawa Shogunate. There is some speculation that one of the famous treatises on Zen and swordsmanship, “the Sword of Taia” written by Soho Takuan, was addressed specifically to Ono Tadaaki. If this was indeed the case, then it lends credibility to the speculation that Itto Ryu became influenced by Zen at a much earlier stage, under Tadaaki. Tadaaki’s son Tadatsune, an excellent swordsman in his own right, founded the Ono branch of Itto Ryu. Of all the major styles, Itto Ryu stands out as being one whose philosophy is the most pragmatic. The style concentrates solely on the art of wielding the sword. While other styles sought to discover religious and spiritual meanings in swordsmanship, Itto Ryu did not. It did only seek technical superiority in swordsmanship and in this, it was very successful. The supreme philosophy of this school is to defeat the opponent with one stroke, hence the name “itto” (which can be translated as “one sword” or “one stroke”). This simple yet fundamental principle continues, not surprisingly, to this day. There is speculation that Itto Ryu became influenced by Zen under Ono Tadaaki due to his association with the priest Takuan. In the Ono style, much of the philosophy that there is, can be seen to be Zen based. Later branches of Itto Ryu such as Nakanishi Ryu ha Hokushin Itto Ryu and Muto Ryu under Yamaoka Tesshu openly incorporated Zen into the art. Many concepts common in Zen can be seen in the techniques used in these schools: techniques which stress simplicity and directness. The nature of the style and the one mindedness of its philosophy indicate a strong foundation in Zen thought. From a technical viewpoint, Itto Ryu strives for simplicity in all actions and movements. It is the hallmark. 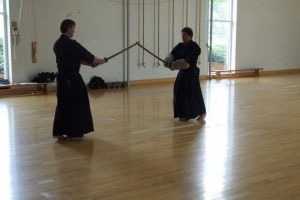 Much of modern kendo originates from Itto Ryu and more recent figures include: Takano Sasaburo and Sasamori Junzo. 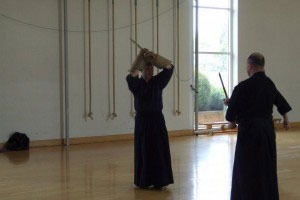 Many of the principles can be found in the techniques used in kendo, particularly the focus on simplicity. Further reading on the relationship between swordsmanship in Japan and the philosophy of Zen can be found here or in the book The Sword and The Mind. Ono-ha Itto-ryu remains as the founding school of the Itto-ryu styles of classical swordsmanship and was founded by Ono Jiroemon Tadaaki, at that time his name was Mikogami Tenzen and he took the name Ono on becoming the leader of the Ryu [school] and successor to Ito Ittosai Kagehisa as the second headmaster of Itto-ryu kenjutsu. When Tadaaki was appointed as the Kenjutsu shinan-yaku - instructor in swordsmanship to Tokugawa Hidetada [Ieyasu’s son], and the second Shogun of the Tokugawa, Itto-ryu became, together with Yagyu one of two official schools of Kenjutsu to the Tokugawa shogunate. Tadaaki also served Iemitsu, the third Shogun, in the same position. The fourth headmaster, Tadakazu, also taught to the lord of the Tsugaru clan; Tsugaru Echigo-no-kami Nobumasa, [The Tsugaru’s fief, is nowadays Hirosaki city, Aomori prefecture, the northern most place of Honshu island], the whole system of the Ono-ha Itto-ryu and thus establishing a separate Tsugaru line. Other clans and senior retainers also began to study Ono ha, both enhancing its reputation and increasing the prestige of the style throughout Japan. Tsugaru Tosa-no-kami Nobutoshi the second lord of the Tsugaru clan returned the responsibility for the transmission of the teaching to the Ono family, when he taught both Ono Tadahisa and Tadakata. The Ono and the Tsugaru families then jointly held responsibility for the teaching Ono-ha Itto-ryu up until the Kansei era (1789–1801), when the seventh head of the school, Ono Tadayoshi then taught Yamaga Hachirozaemon Takami, a retainer of the Tsugaru clan, the entire Ono-ha Itto-ryu system. The Tsugaru and Yamaga families then worked together in an informal coalition to transmit the system. This continued into the Taisho era (1912–1926). Sasamori Junzo 1886-1976 was born in Tsugaru and started to learn Itto-ryu in the 1890's from Tsushima Kenpachi. Tsushima sensei was the former master of Itto-ryu for the Tsugaru Clan and as previously stated, the Tsugaru Clan's Itto-ryu had succeeded as the legitimate lineage of Ono-ha including partially adopting Nakanishi-ha gekken Kenjutsu (one of the first types of Kendo to appear at that time) as a part of its practice. Finally Sasamori Junzo acceded as 16th Soke to the legitimate Ono-ha from Yamaga Takatomo the previous successor of Ono-ha for the Tsugaru Clan. His son Sasamori Takemi succeeded his father to become the 17th and current Soke of the school. The lineage of Itto-ryu also includes Hokushin Itto-ryu with such famous figures such as Chiba Shusaku, Ito Kashitaro and Naito Takaharu. Nakanishi-ha Itto-ryu founded by Nakanishi Chuta and later with Takano Sasaburo. Kogen Itto-ryu. Itto Shoden Muto-ryu founded by Yamaoka Tesshu and the Mizoguchi-ha Itto-ryu founded by Mizoguchi Shingoemon Masakatsu, a student of the second headmaster of Ono-ha Itto-ryu, Ono Jiroemon Tadatsun before creating his own style of the Mizoguchi-ha. Was born into a farmer’s family in Saga Prefecture in 1896. 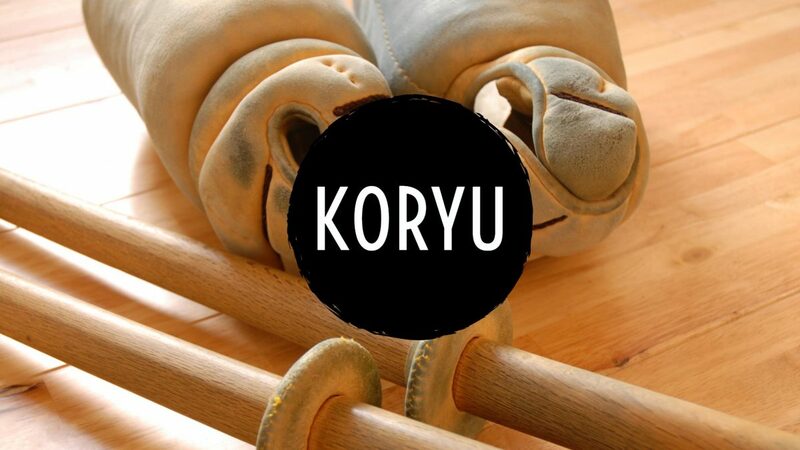 He started Kendo when he was 11 years old and moved to Kyoto after junior high school. At the age of 18 and entered the Butoku kai Honbu where he was taught by the most high level teachers. After this period ended he became Shihan at the Shiga Prison and the Shiga Prefecture Ohtsu Polytechnic School. During this time he visited Manchuria for his further study and training and later to Korea where he became Shihan to the Butoku kai’s Korean Branch. After this he moved to Tokyo for his further training and became Shihan at Tokyo Police (Keishi-cho) and the Kokushikan School, he was 38 years old at that time. .
Born as the first son of Jussei in 1926. He started Kendo when he was 9 years old. In 1943 he entered study in the Kokukan Kendo course at the Kokushikan School. From 1947 he began to study Ono ha Itto ryu under the 16th Soke Junzo Sasamori. He was awarded Kendo Renshi in 1953 and became Shihan of Seijudo Kendo Dojo in Setagaya in 1954. In 1957 he obtained 6th Dan and awarded Kyoshi in 1958, obtained 7th Dan in 1961 and was awarded Ono ha Itto Ryu Menkyo-kaiden from Sasamori sensei in 1972. He retired as Shihan from Seijudo in 2004, but continues to study and practice both Ono ha and Shinai kendo today. The Ono ha Itto Ryu that we study was transmitted to Kodokan under the personal instruction of the late Ono Torao sensei Kyoshi Nanadan, Shihan of Seijudo Kendo Dojo Setagaya: Ono ha Itto Ryu Menkyo Kaiden from Sasamori Junzo sensei. The Mizoguchi Ha Itto Ryu was founded in the early Edo period (1630s) by Mizoguchi Jingozaemon Masanori a direct student of Ono Jiroemon Tadatsune (The second headmaster of the Itto Ryu and founder of the Ono Ha tradition). A student of Mizoguchi sensei called Ito Masamori visited the Aizu Han (in present-day Fukushima Prefecture), where he taught Edamatsu Kimitada a clan retainer. Masamori sensei unfortunately left before passing the entire system to Edamatsu. Edamatsu transmitted his understanding of the system to Ikegami Jozaemon Yasumichi, who later went to Edo (Tokyo) on his lord’s orders to continue his training in swordsmanship. Ikegami studied not only Mizoguchi-ha Itto-Ryu, but other kenjutsu styles as well. Later, with more training and experience, Ikegami incorporated his ideas and experience in Mizoguchi-ha Itto-Ryu and other systems and founded his own variation of the system. This became the Aizu line of Mizoguchi-ha Itto-Ryu kenjutsu, which has passed down through warriors of that domain to the present day. Because of the partial nature of the original transmission, and subsequent developments in the art as it was practiced in the Aizu-Wakamatsu area, there are differences between Mizoguchi sensei’s original art and that practiced by swordsmen of the Aizu. The original line of the Ryu has been lost, so it is difficult to tell just what these differences might be. Presently, the Fukushima prefecture local kendo federations are responsible for practicing and transmitting the art to future generations Within Fukushima Prefecture there still exists a related but different tradition located around the former home of the Aizu clan. Interestingly, although Takeda Sokaku, the founder of Daito-ryu, claimed to have maintained the traditional teachings of the Aizu clan within his system his son, Tokimune believes that the core of his approach to the sword was based upon the Ono Ha Itto Ryu rather than the Mizoguchi ha Itto Ryu. Daito Ryu is of course the old tradition that shaped modern Aikido. In the Sayu Tenka Demi No Hitachi there are five odachi and three kodachi katas. Shidachi begins with pressure to develop suki and initiate sen, then uses a strike to draw out Uchidachi’s attack. The attack is then reflected back at the Uchidachi by evasion or deflection. This is quickly followed up by a decisive cut (Kazushi), usually to the back of the neck (Kesa Gake), an angled slicing cut with the mid point of the blade into the side/back of the neck, striking down between the second and third vertebrae. The kata are done without kiai and should build in speed and intensity from Odachi Ittenme to Gotenme, and then again from kodachi Ittenme to Santenme. The footwork and movement should be smooth and light. The main difference in Riai between the Nihon Kendo No Kata and the Mizoguchi ha Itto Ryu is that Uchidachi leads and performs the techniques, Shidachi then being the loser. 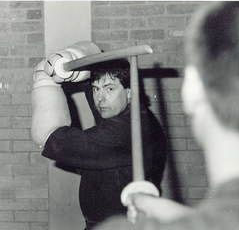 From Paul Budden - Kodokan and Gary O’Donnell - Do Shi Ken Yu Kai, personal notes on the Mizoguchi Ha Itto Ryu Heiho and the teaching of Hiroshi Ozawa sensei. In April 1947, Wada sensei returned to Aizu-Wakamatsu with his family, where he found Kendo activity deteriorating, he then started to work towards the reinstatement of Kendo with his colleagues. Mizoguchi-Ha Itto-Ryu is one of the Aizu Five Ryu-Ha and was specifically taught secretly, forbidding indiscretion and had never been exposed to the public before. On this day the old tradition was broken and Sayu-Tenka-Demi-no-Hitachi was performed in front of public spectators in the full light of day. Translation from Kendo Jidai April 2009 by Kazuyo Matsuda. Mizoguchi-Ha Itto-Ryu has been transmitted to Kodokan under the personal direction of Ozawa Hiroshi sensei Kyoshi Hachidan, Meguro Hideharu and Ninomiya Itaru sensei, Kyoshi Nanadan. 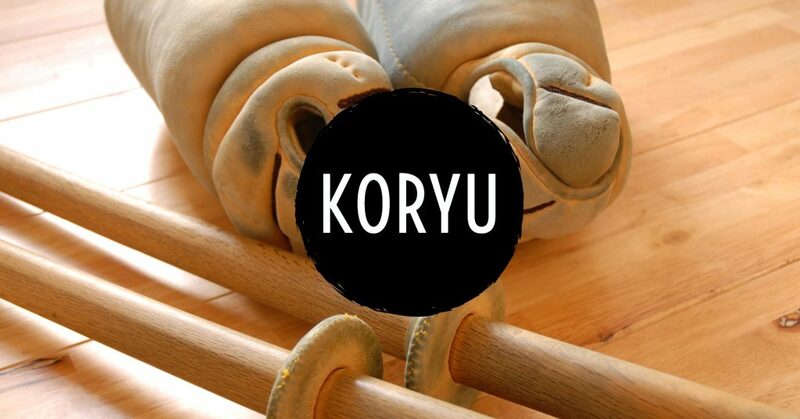 Koryu sessions are held on the last Monday of the month: 8.45 to 10.30pm.